When you specialize in sophisticated mobile surveillance solutions, it helps to have a sophisticated, mobile power source. Enter the EFOY Pro fuel cell. 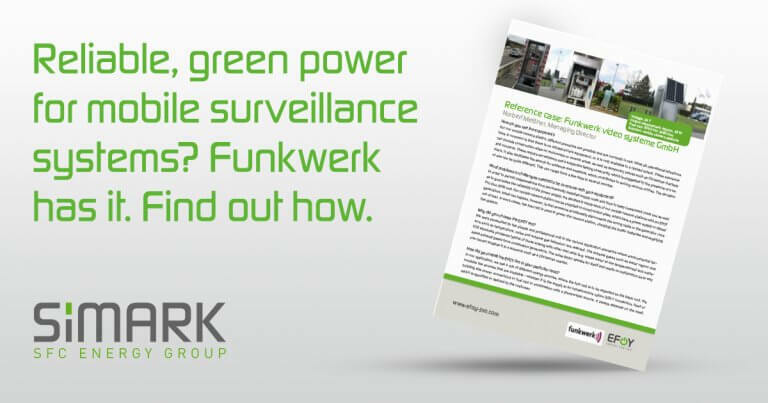 Find out how Funkwerk, a leading supplier of communication, information and security systems in Germany, is utilizing the EFOY Pro Duo 2400 to deliver self-sufficient, video monitoring solutions to its clients. How do you use the equipment? For our mobile camera station, different scenarios are possible and are currently in use. What all operational situations have in common is that there is no infrastructure equipment, or it is only available to a limited extent. These scenarios can include construction sites on motorways or remote areas, as well as temporary events such as Christmas markets and concerts. These require surveillance and a subjective feeling of security, which is suggested by the presence of a camera. It also facilitates the search for evidence and suspects, which contributes to solving various crimes. The duration of use can be quite different. This can range from a few days to several months. What problems or challenges needed to be overcome with your equipment? In order to permit independence from permanently installed supply units and thus to keep investment costs low as well as to guarantee the reliability of the power supply, we decided to equip each of our mobile camera stations with an EFOY Pro Duo 2400 unit. Our mobile camera station can be supplied on construction sites, which have a power supply or diesel generators. What can happen, however, is that someone accidentally disconnects the wrong cable or the generator runs out of fuel. In such cases, the fuel cell is used to power the camera station, charging the buffer batteries and supplying the system. We were persuaded by the simple and professional unit in the various application scenarios where environmental factors such as temperature, noise and exhaust gas behaviour are relevant. The exhaust gases such as water vapour and CO2 eliminate problems typical of those arising with other fuel cells (e.g. waste water at low temperatures) and unpleasant exhaust gases from combustion generators. The noise factor speaks for itself and needs no explanation as to why one cannot imagine it in a scenario such as a Christmas market. How did you install the EFOY Pro in your particular case? In our application, we use a mix of different energy sources, where the fuel cell is to be regarded as the basic unit. We combine the sources that are available – whether it is the supply at an infrastructure option (230 V connection, fixed or building site power connection) or fuel cell in combination with a photovoltaic source. It always depends on the need, which is specified or desired by the customer.